Many people believe that know how to cook hard boiled eggs. But in this case there are a few subtleties that need to be considered to get excellent results. This method is preferable that minimizes the number of broken during the cooking eggs. At the same time, it is difficult to calculate the total time of cooking. Wash the eggs. 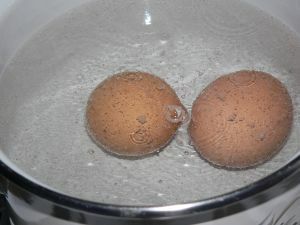 Then put them in a container for boiling and pour such a quantity of cold water to it just covers the eggs. Water for cooking is also necessary to add 1-1. 5 teaspoons of salt. Salt is essential in order to prevent bursting of the shell and to increase the boiling point of water. Place a receptacle with salt water and eggs on the stove. Once the water boils, reduce heat and simmer the eggs for 7-8 minutes. Pour into the pan a small amount of water (as much as you need to ensure that all eggs were completely surrounded by). Add the water 1 – 1.5 tsp. of salt. Put the saucepan on the burner and wait until the water boils. Before you boil eggs, they must be washed. In boiling water carefully using a spoon lower the egg so it didn't hit the bottom of the pan. Note the time on the clock – hard boiled eggs boil for 7-8 minutes. At the end of cooking pour the boiling water and fill the basin with eggs in cold water. Leave for a few minutes. Cold water will not only cool the boiled eggs, but also make their further cleaning of the shell easier. Do not send eggs on the stove as soon as took them out of the refrigerator – allow them to get to room temperature. Do not boil eggs in hard-boiling water, to avoid them bursting. Now for the question, "how long to cook hard boiled eggs". Be sure to use a timer – do not prepare hard-boiled eggs "by eye". Overcooked egg has a "rubber" protein, unattractive white coating on the surface of the yolk. 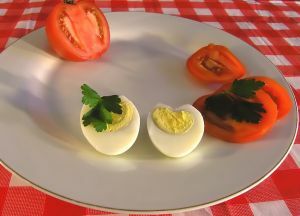 Hardboiled eggs, as independent dishes are served both cold and hot. To clean hard-boiled eggs from the shell only required if they will be used as part of dishes (salad, snacks, hot). If the egg is served on their own – to clean the shell is not necessary. If your house boiled eggs are popular – it makes sense to acquire useful device called the egg boiler.